Administrators note: Before beginning this story I would like to introduce the BHS audience to Rafid. He’s from South Tangerang, on the island of Java and has recently completed his studies in Marine Science at the University of Jenderal Soedirman, Purwokerto Central Java. 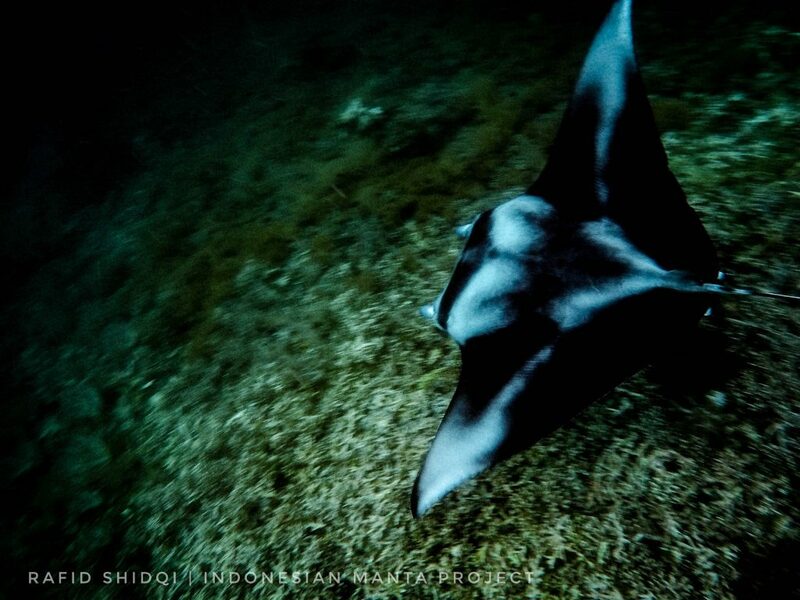 Last May he became the newest member of the Indonesia Manta Project in Raja Ampat. 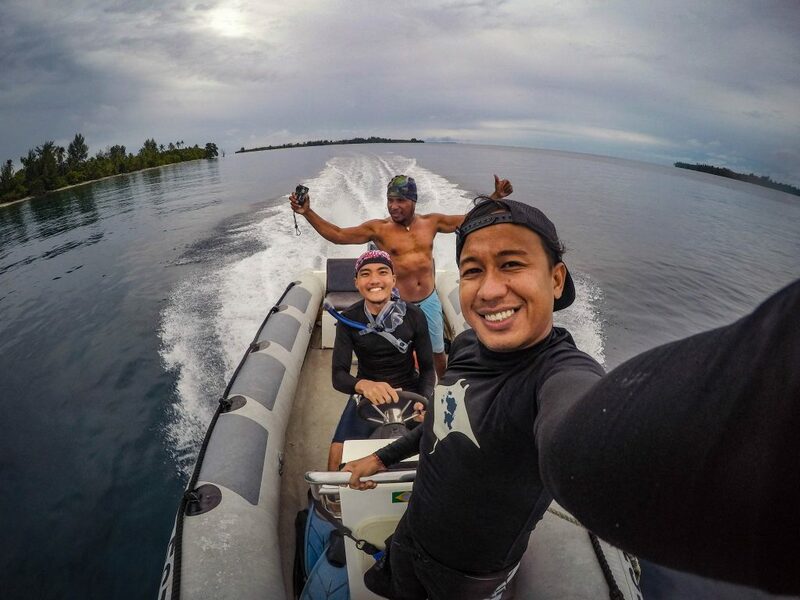 In his role as Raja Ampat Field Officer he is involved in conducting photo ID research on Raja Ampat’s manta rays, studying their population status and vulnerability. He also is involved in facilitating “Kader Manta”, a group of local youth employed to work in manta conservation. 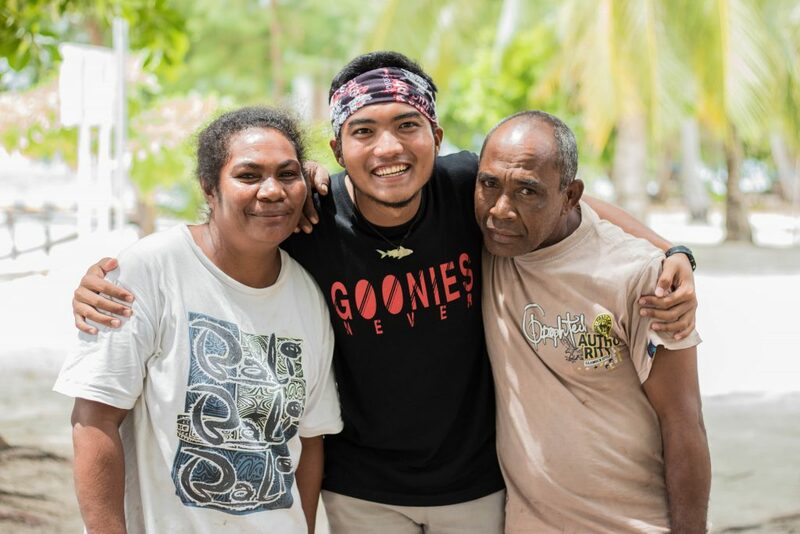 His work involves providing these youth with basic english and presentation skills, as well as manta ray ecology and conservation. He’s young, social media savvy, and very keen to make a difference in BHS conservation. We are excited to have him on the team. He will be making frequent posts about his work and his new life in Raja. This is his first contribution. The sky was crystal clear, as blue as the ocean that morning. The waves were calm with a bit splash, pushing the sand along the edge of the shore. Some hermit crabs were running away, avoiding getting wet once again. The wind blows calmly and one small long-boat passes by a few meters in front of Meoskor’s Ranger station. (This is the new ranger post for the Fam MPA located near Fam village). It was my 2nd month working with the Indonesian Manta Project and, so far, it’s been an amazing adventure. Living with a sea-morning view right from your bed, is almost too-good-a-life to be imagined. This is not a mere holiday, however, I’m involved in a mission of conservation to understand the mysterious life of the manta rays of Raja Ampat. Working as a junior staff member within the manta project has given me exposure to the field life of a conservationist, which is both challenging and exciting. During these past 2 months, I was with the two of Conservation International’s (CI) staff members, Abdy and Ronald who helped me a lot. They arranged everything and helped me get used to my new life. 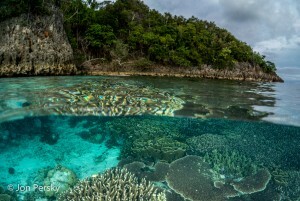 I was really worried at first, because not only will this life hopefully become my full-time work but because I could barely imagine what Raja Ampat even looks like. My main job with Indonesian Manta Project is focusing on photo identification, while conducting a survey of Raja Ampat waters, analyzing environmental conditions and observing manta ray behavior and the ecosystem. My work will become part of the backbone of long-term conservation research. Despite doing it almost every day, there is always something new and unusual to be remembered. 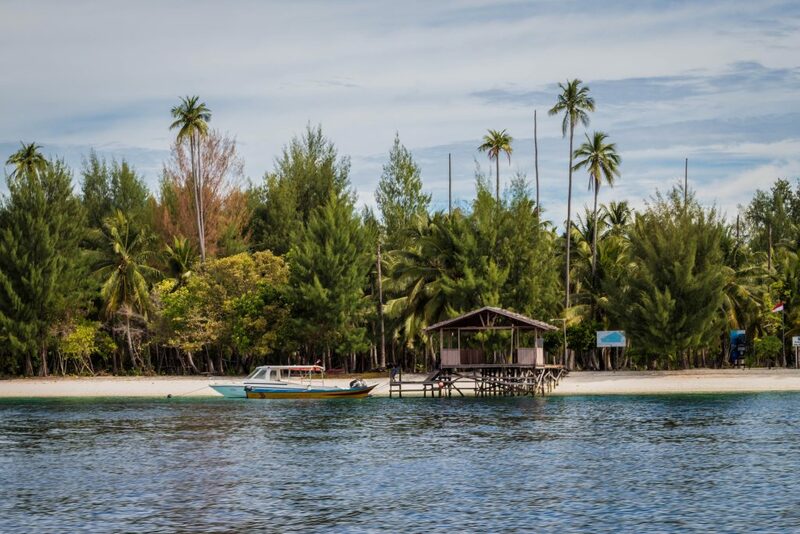 “Imagine a small uninhabited island, nothing exists there but a ranger station. 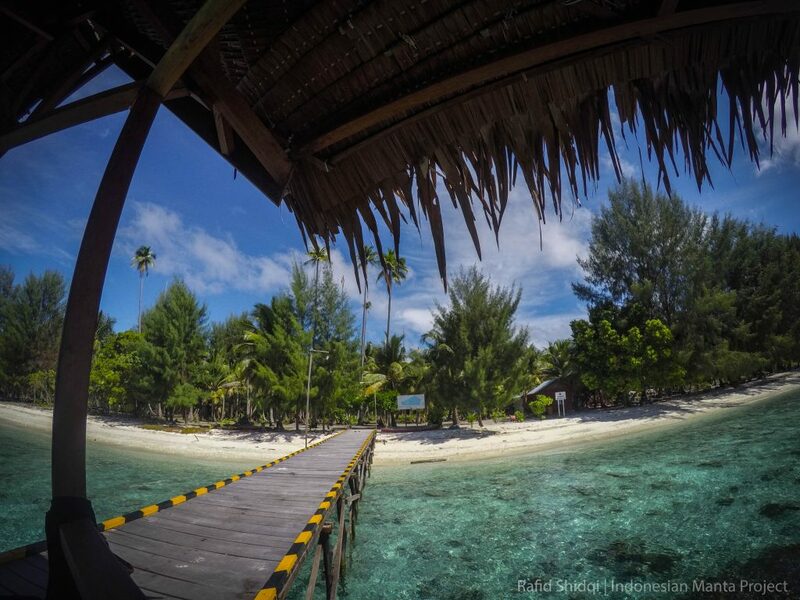 And I live there!” that’s how I explain my workplace to my colleagues who frequently ask where do I live in Raja Ampat. 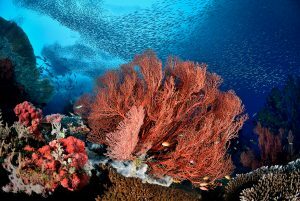 Understand that for most Indonesians, Raja Ampat is like a crown jewel of our country: it’s an exclusive place, located somewhere (?) in the east, secluded, and takes millions of rupiahs to reach. That’s why they envy me so much for having a job in the epicenter of marine biodiversity which often becomes the spotlight for many documentary channels, like Discovery and National Geographic. Because the days can be very busy I got used to the life very fast. We often survey from morning until twilight. There’s hardly time to record all the data obtained on that day and charge all the batteries for our cameras in order to do it again the following day. At the end of the day the only time I have left is for sleep, or drinking coffee on the jetty while talking with some of the locals, who are teaching me a lot about life in Papua. Sunrise and sunset in Meoskor can be beautiful every day; and I soon realized that living without a “signal” is a blessing, because I can be connected and attached with the real life I’m living now. I also love how people here are very warm and welcoming. I remember on the first day Ronald, Abdy and I arrived at Meoskor, we were met by the two women who help with the cooking. The moment we touched the ground they shouted, “Hey Ronald! We don’t want to serve you! We have enough people to feed and don’t want to squeeze out more of our energy to provide extra for you!” It was a joke, obviously. But that’s just an example of how warm they are. They hugged us, and eventually, provided us tea and coffee. Since then, they have become our happiness after a long day’s trip searching for manta rays. We always close the day with hot pisang goreng (fried bananas) and tea together with all the rangers at Meoskor. What a family! 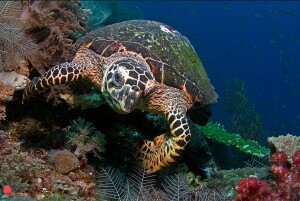 Meoskor is included in the Fam Marine Protected Area, the newest in the Raja Ampat MPA Network. Because research is still limited this is the reason why we focus on exploring manta rays in the area. 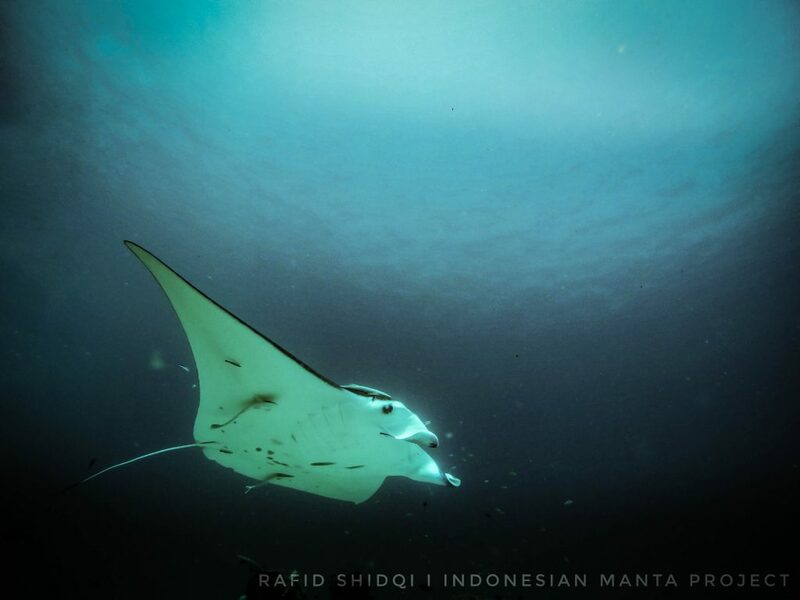 During my last short trip in February, manta rays were sighted a few meters from the shore of Meoskor. They gathered in huge numbers (up to perhaps 30 at a time for feeding, which was awesome!). But during this month, not many manta rays have been sighted near Meoskor, so every morning we have to explore neighboring islands using CI’s precious rubber boat, “ESTE”. Our survey locations are often based on valuable information we receive from the locals. 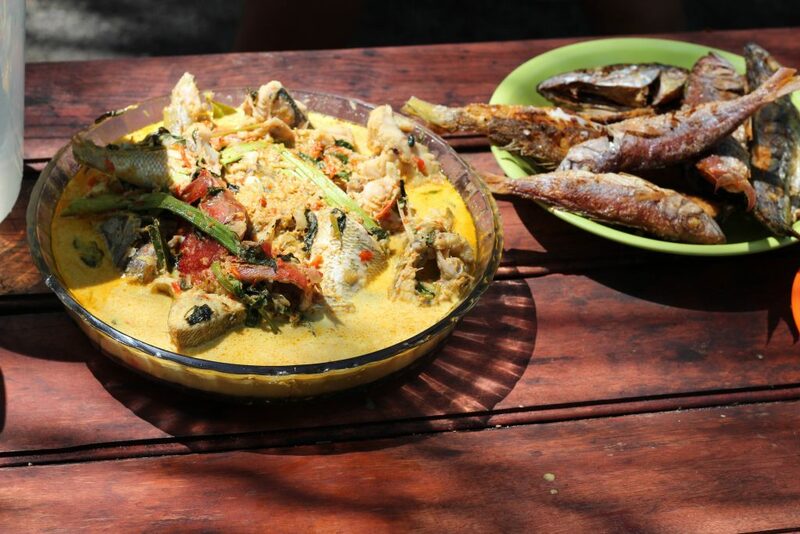 Sometimes when surveying, we encounter local villagers out fishing, and ask them whether they’ve seen manta rays around. They’ve told us that mantas are often sighted near the Fam village around 4 pm, or the cliffs near the Saukabu village, which takes 10-15 minutes to reach by ESTE. Big Andau and small Andau islands however, became the most common sites we explored every morning. We usually started the survey at 8 am. According to the CI’s acoustic research, the peak of manta ray activity is one to two hours after the low tide or 4 hours after the high tide, although this can be vary depending on sites and their behavior. When we see fin flaps on the surface, that’s the sign the manta rays are beginning to feed. Our goal is the use the info gathered during the surveys to confirm that this assumption is correct and to find out more about their behavior. For some weeks, we encountered them feeding near the same GPS point around Andau. One morning Ronald wondered, “Where is the cleaning station.” So we decided to take our cameras down with us the next time we visited. The morning was quite strange because no mantas were sighted in the usual area near Andau. Mantas, however, are often shy! When the mantas are solitary or cruising along the outer reefs near open ocean they are difficult to approach. The visibility was not good that morning, only 6-7 meters but we decided to descend anyway. 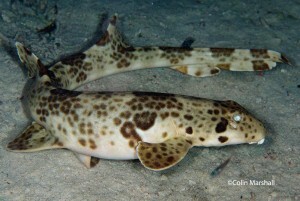 The bottom was sandy with a few patches of reef, what we call bommies. After a couple of minutes we encountered two reef mantas (Manta alfredi) cruising below us, one all black and the other marked with a distinctive chevron. We were very excited but as we descended the mantas disappeared. As we swam near the bottom we approached three bommies in a triangle formation. 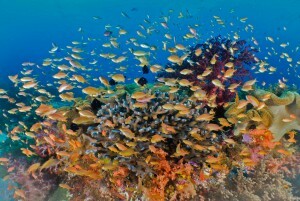 We weren’t sure if this was the cleaning site or just patch reefs. As we approached one of the bommies, however, the chevron manta returned. It was a female! She noticed us but kept getting closer to where we were diving. Several minutes later, we realized that she was actually visiting for cleaning. We observed her for quite long time. As she swam slowly around and around the bommie she attracted many small cleaner fish, sometimes she looked like the cleaning “tickled”! Although she knew we were observing, she stayed there looking curiously at us; even sometimes swimming right above us, waiting for our exhaust bubbles to “tickle” her belly. What a friendly manta. Then I remembered, we actually encountered her on previous days. 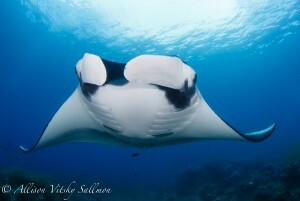 It was quite easy to determine because of her chevron pattern, which is distinctive on every manta. Maybe she recognized us and that’s why she approached, trying to tell that she missed us so badly. Maybe? On the surface Ronald excitedly exclaimed, “What did I say? Here is the cleaning site! I knew it since I have observed it before with Mark (Erdmann). Now I have to declare this place as “Ronald Point”!” We found a new cleaning site, yay! During our stay in Meoskor, it was really strange because we encountered so few mantas in comparison to our previous visit. 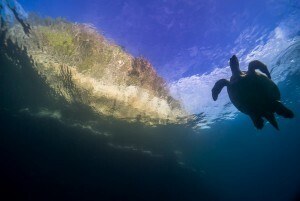 This left us wondering where all the mantas had gone? 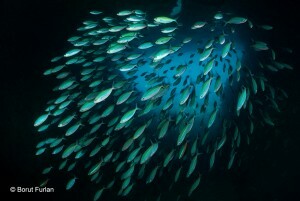 Although we encountered quite many during this visit, mostly we saw single individuals. Quite often we saw the same individual utilizing the same site for feeding. But despite the plankton being really dense, few mantas were sighted. This still remains a mystery. 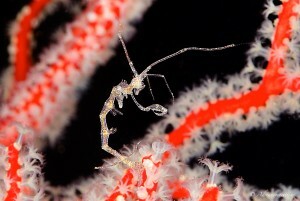 Further work is coming up, so I hope we can explore more sites to discover the puzzle of these beautiful animals. I haven’t seen a oceanic manta (Manta birostris) yet, but I hope I encounter one very soon!